'Civilisation began the first time an angry person cast a word instead of a rock.' So spoke the Viennese brainbox, Sigmund Freud, who cast a fair few wise words in his time (and one or two loopy ones as well if we're to believe today's clever clogs). 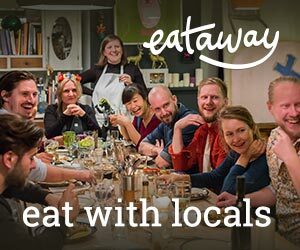 We hope that rude waiters and mad taxi-drivers won't prompt you to cast either rocks or rash words, but there's no doubt that speaking a bit of the lingo makes all the difference when you're finding your feet in a foreign city. The tips below won't have you ready to lead a course on comparative psychology, but they could come in handy on the absolute basics of the language. We've thrown together some of the most basic words in the blue box below, but if you want to suddenly show a flash of brilliance - even if just for a second or two - memorise these for those crucial encounters: Mit der Dummheit kampfen Gotter selbst vergebens. Against stupidity even the gods struggle in vain. Moge die Macht mit dir sein. May the Force be with you. So onwards friends - let's learn some Deutsch....! 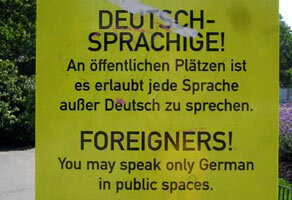 Funny, the sign says: "Germanspeaking-don´t speak German here" and for foreigners,"Do speak only German". Like Martin (Argentina) I also tried clicking & listening but nothing happens. However, apart from that, cheery, informative page. Excelent site! but the language bar doesn't produce any sound when I click :( Thanks for all the information!